14. A. PRIDIE IDUS MAII 14. 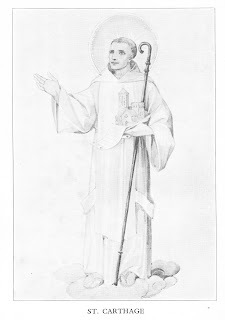 St. Carthage or Mochuda was born in vicinity of Castlemaine 564; as a boy while herding his father's flocks he forms a friendship with Maoltuile, Chieftain of Ciarraighe Luchra; at age of twelve he meets Bishop Carthage, the Elder. After some opposition on part of his father, the boy becomes a disciple of the Bishop. He makes religious profession at age of twenty, 584; is ordained priest and founds monastery of Kiltullagh 590-592. Compelled to leave Kiltullagh, he visits Bangor, where he spends a year. Various other visits. At last he founds Rahan 594-595. Spends forty years at Rahan during which he occasionally journeys to Kerry and the South. Expulsion from Rahan, Foundation of Lismore 635 or 636. Death 637.
by Father John Ryan, S.J. 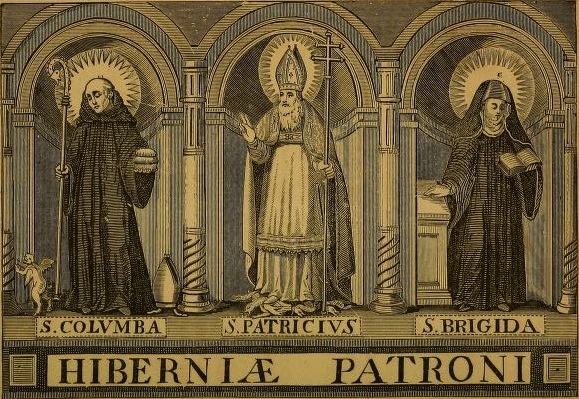 St. Carthach's life belongs so much to the seventh century that he is usually not numbered among the great monastic founders. Legend relates that St. Columcille visited him at Rahan, but the celebrated Saint of Iona was about to enter on the way of eternity when first settled in the midlands, and it is not recorded, nor is it likely, that he left his island home in the closing days of his earthly pilgrimage. Whilst St. Carthach was still young Monasterboice had entered on the the second century of its existence. Before his death Iona had been ruled for fourteen years by its fifth abbot, and no less than six successors of St. Ciaran had sat in the abbatial chair of Clonmacnoise. His appearance is thus at the end rather than at the beginning of Irish monastic origins. Yet the life of St. Carthach differs in no substantial feature from the lives of the distinguished founders of the sixth century. The tragedy of his expulsion from Rahan, which has given him a place apart in monastic history, which was not the consequence of any personal eccentricity. He had come from Kerry to Meath, but hundreds of monks before him had left their native heath and had been acclaimed enthusiastically by the people among whom they settled. Thus St. Enda though born in Meath was welcomed in Arran; St. Bairre, a Conachtman, was welcomed in Cork; St. Brendan came from Kerry to Clonfert, St. Cainnech from Ulster and St. Molua from Limerick to Ossory; and so on. That St. Carthach fell a victim to regional jealousy is a phenomenon so strange that it calls for special explanation. Some light is thrown upon it by the politics of the day, on which a word will be said presently. To assure proper balance and proportion it is of supreme importance to note that the expulsion from Rahan has a very small place in the record of St. Carthach's doings and sufferings. Attention should be fixed on the life led by him and his monks and on the good done by their example and teaching during the forty years of their activity in the midlands. This is what Father Carthage's simple, sincere, and devotional biography so effectively helps to achieve. Those who read this book will find themselves deeply moved by the ascetic earnestness of those early days. St. Carthach's Rule tended, if anything, on the side of strictness. The Saint refused at first to acquire even an ox or plough, so that tillage had to be done by the spade alone. The land about Rahan, rich and fertile beyond what would be expected in that relatively barren countryside, still bears witness to the enrichment of the soil by many generations of monastic toilers. In old age as in youth St. Carthach remained rigid in his preventative measures against relaxation, to such an extent that some Britons among his monks, distraught by the stern discipline, determined to drown him in the neighbouring Cloddagh! But pleasant memories also survived of the Saint's kindliness and charity, and there can be no doubt that Rahan and Lismore, like the countless other monasteries of the country, were homes of prayer and work and tender selfless piety, replete with the spirit of gladness that springs from the love of Christ our Saviour, verdant oases in the dreary waste of human pride and cruelty. To return to the expulsion from Rahan. The early seventh century was a period of rapid advance of the Eoghanacht power of Munster and of Uí Néill power in Central Ireland. In the clash between the dynasts of these proud, ambitious septs, St. Carthach came unwittingly to figure. We must recollect that men whose names the passage of time has clothed in a romance of legend were to their contemporaries just ordinary beings of flesh and blood who controlled political destinies. Such a prince in Carthach's childhood was Diamait, son of Fergus Cerrbeóil, son of Conall, son of Niall of the Nine Hostages. Diarmait's chief fortress seems to have been at Kells. His son Aed Sláine, and his son Colman Mór, became ancestors of the ruling families in the eastern and western midlands. Rahan was founded within ancient Mide territory when Aed Sláine was Joint-King of Ireland. After that monarch's death the policy of Uí Néill expansion was pursued vigorously by five of his sons. At this time too, the Eoghanachts of Munster were adding day by day to their strength in the South. Munster territory, moreover, happened to include a section of Éile which was later transferred to Leinster. Through this small state Munster extended so far north that Rahan might also be regarded as a frontier monastery. 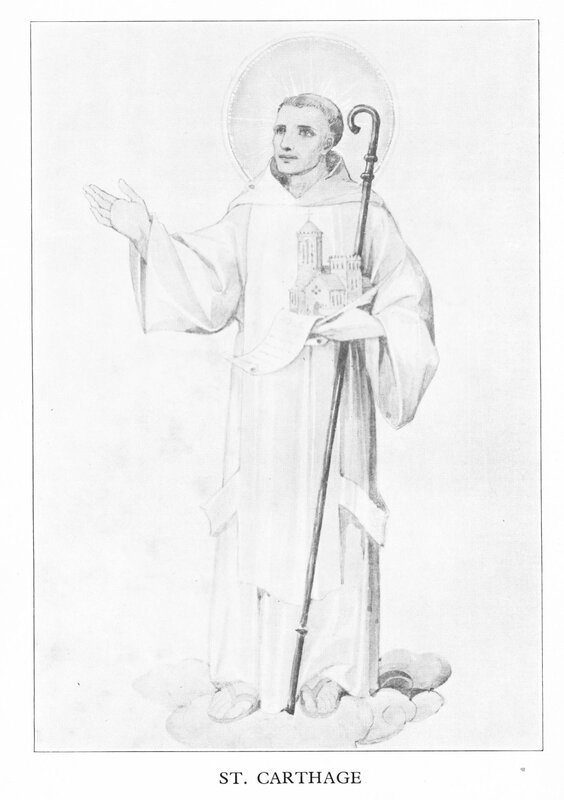 Now St. Carthach was a Munsterman and many of his monks were doubtless drawn from the same province. Rahan might thus be looked upon as a Munster foundation just within the Mide border. As such it was obnoxious to the sons of Aed Sláine, who in 636, in a time of extreme political tension, compelled the aged abbot to return to his own people. The episode was so dramatic that the storytellers seized on it avidly as the ground-work for a tale. Thanks to their expert hands the romance of the expulsion makes good reading, but who can tell how much of it is history? Thus, the sinister role, as instigators, assigned to the abbots of Clonard, Durrow and Clonmacnoise, must be considered doubtful; all the more so as the abbot of the last mentioned monastery, Crónán Derg, was himself a Munsterman. What can be said with certainty is that St. Carthach was expelled from Rahan by local overkings, the sons of Aed Sláine, and that the blow was borne bravely by the outraged abbot and his faithful community. Man proposes but God disposes. What was meant to be a humiliating retreat, became, in fact, a triumphal march; and what appeared to be a catastrophic end became, in fact, a glorious beginning. St. Carthach's misfortunes brought him generous sympathy in his own Déise country, and before his death he had seen arise a new foundation that was to outshine Rahan in brilliance. For the jewel that had been snatched away a brighter jewel was providentially substituted. All that Lismore did to promote the honour of God and to perpetuate the memory of St. Carthach is described delightfully in Father Carthage's pages. Father Carthage O.C.S.O., The Story of Saint Carthage, (Browne and Nolan, 1937), ix-xii. After this, finding his strength failing him, on account of his labours and extreme age, the holy bishop began to feel a great disinclination for interruptions caused by people, who flocked to him from every side. Having taken council with the brethren, and obtained their unanimous consent, he went to a certain secret and safe place. Here, there was a renowned monastery, in a valley. It lay eastwards from his own greater monastery, and yet, not far removed from it. Here, too, with a few attendants, he remained during a year and six months, leading an eremitical life, and being wholly occupied, in the contemplation of holy things. After some time spent in this place, he was visited by his monks, and by some of the older and more decrepid brethren. To these, he addressed religious discourses, full of instruction, on dogmas of the Church. His homilies also contained admonitions, suitable for the lives of those, to whom they were directed. The author of his Life represents Carthage, as a solace to the aged; as safety, for the infirm; as a source of consolation, for the sorrowful; as a foundation, for those in despair; as abounding in faith, for those in doubt; and, as a firm guide, for those who were young. St. Carthage saw, that the holy old men and many of his monks had much trouble in ascending and descending the steeps, leading to that valley, where he dwelt, and when coming to visit him. Finding that his end was fast approaching, he called the brothers, and then ordered, that he should be brought to the parent house, so that he might not be an occasion of further trouble to them. But, the merciful and omnipotent God had now intended to remove his illustrious servant, from the scene of his labours. The Heavens were suddenly opened. Then, an army of Angels was sent, and it seemed as if these blessed spirits were moving in triumph to welcome him. On seeing the Heavens open, and the Angels advancing towards him, St. Carthage caused himself to be brought into the middle of the valley. Telling the holy seniors what he beheld, he ordered the Body and Blood of our Lord to be brought, and towards a place, where a fountain was afterwards seen. Here, a cross was also erected, and it was called, in future time, "the cross of migration." Having then given many pious admonitions, and having received the Body and Blood of our Lord, in the Most Holy Sacrament, being surrounded by his holy seniors, and a multitude of brothers, he bade them all farewell. Then, kissing each one in order, with great piety and affection, he ascended with the Angels from earth to Heaven. The holy Abbot departed this life, on the second of the May Ides 7—corresponding with the 14th of this month—the date assigned for his feast. His death is placed, so early as 631, in the Bodleian copy of the Annals of Inisfallen; but, at 636, by Duald Mac Firbiss, as also in the Annals of Ulster, of Innisfallen, and of the Four Masters. The feast of St. Carthach is commemorated, in the "Feilire" of St. Oengus, at the 14th of May. At the 14th of May, in the Martyrology of Tallagh, his name is set down as Carthaigh, /.., Mochutta Lis-moir. On the 14th of May, the Kalendar of Drummond inserts the Natalis of St. Carthach, Bishop and Confessor, in Ireland, with an encomium on his virtues. This day, the Martyrology of Donegal enters the name of Mochuda, Bishop, of Lis-mor ; and, as it notes, he was also abbot of Raithin, at first. Under the head of Lis-mor, Duald Mac Firbis enters, Mochuda, bishop, quievit 636, May 14th. I've just come over from the Catholic Heritage Blog to say how much I adore the work you're doing. Thank you very much, Veronica, I appreciate your support.